Welcome to our third Grand Vacation Achievers Blog Hop. The theme for this hop is Perfect Pairs ie. Something old (carried over) with something new. from the new annual catalogue. I have decided to pair Butterfly Basics, which was also featured in the last Occasions catalogue with the new English Garden Designer Series Paper from the new Annual Catalogue and I personally think that they are in fact 'perfectly paired' and compliment each other.....well, perfectly! 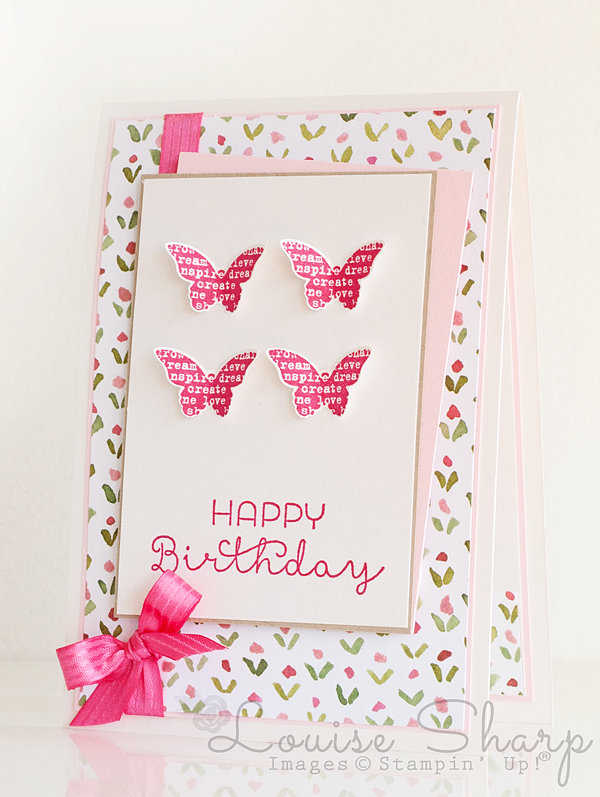 I also used the new stamp set Cottage Greetings on page 94 and thought that the Happy Birthday 'paired perfectly' with the butterflies and the English Garden Designer Paper. Want to know another new favourite? If you think it's the Stitched Satin Ribbon in Melon Mambo, then you have got it in one! Yep, that's my new favourite ribbon. LOVE this ribbon and there's no doubt you will see more of it on future projects. Now onto the next person....be sure to click the person located after me on the link list. Please comment when you're clicking through the list, we all enjoy getting a bit of love on our blogs and it lets us know you've stopped and been inspired. Very pink! Very you! Well done! oh, this is so stinkin cute!.....I love Pink! Such a pretty, happy card. Anyone would love to receive this. I love your style (and all that pink). This card is calling out to me.. I need to make one right now! That bit of Melon Mambo satin ribbon was just the PERFECT finishing touch. Love it Louise! totes adorbs babe! 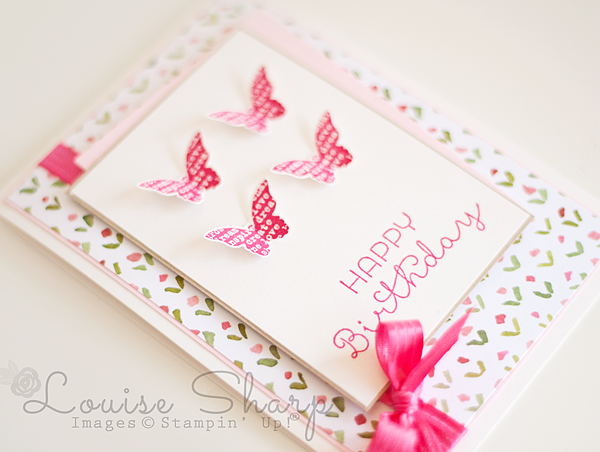 Another Lou-Lou stunner and I could not bear to part with a card like that. . .always love your pink creations but this one is a stand out because it isn't totally pink lol! Awesome woman! Absolutely gorgeous!!! Love it. It is very you - stunning. GORGEOUS!!! It's so "girly" and I need some "girly" things right now! I love that side of that DSP and what a sweet use of it. Can't wait to get to my craft room. Love the font in the sentiment!